Another fantastic story from The Prometheus Saga. I'm loving how different all the stories in the saga are. The premise of all of them is that an alien being named Prometheus was sent to Earth to live among humans studying them. We get to dip into different times in history where this being affected the people around it and in some cases the course of history. It's really fun. This time we get to visit a port where sailors clog the docks and moored boats. My favorite thing about this story was the setting and the sense of destiny. The main character is a cartographer trying to change the world by making a better map of the world. The Prometheus character has a hand in helping the determined youth. The story goes on and we find another young enthusiastic cartographer with the same ambitious goal. In ways you can only discover by reading this great story the Prometheus character helps this young man as well, as does a map made from the first character we meet in the story who also had a hand from the Prometheus. 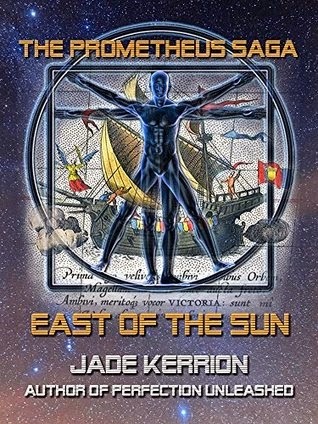 The author Jade Kerrion writes beautifully. The rich world of boats, sea ports, and bars come into full brilliant detail in your mind as you read. I was excited, nervous, and scared with the characters. The sense of importance you feel coming from the two main characters is inspiring and makes the story feel epic. I love how the author uses the Prometheus character to give us an anchor through the different time periods we get to visit in this story, and at the same time keeps us guessing as to who it will turn out to be. Since the Prometheus is a shape shifter you never know who it's going to be. I'm really glad I read this story. It was well written, fun, had a grand epic feel, and did a great job conveying the environments the characters walk through. Have you read any books in The Prometheus Saga? Let us know in the comments! I haven't been disappointed by one yet. Thanks for stopping by!